The Ferrari 488 Spider rental is one of our most popular cars at Dream Exotics in Las Vegas. You don’t have to be an expert car enthusiast to know that when you drive a Ferrari, you’re among the ultimate examples of success, style, and fame. At Dream Exotics, you can choose from a collection of distinctive luxury brands, makes, and models including the drop-dead sexiest convertible available, the Ferrari 488 Spider. The Ferrari 488 Spider’s design was influenced by Italian racing history. Drivers lucky enough to experience or own a Ferrari 488 Spider claim the thrill of driving this convertible is unlike any other sports car on the road. The front end is reminiscent of F1 racing and includes flaps that change the rear diffuser, affecting the down forces and cutting the drag at both low and high speeds. The craftsmanship and engineering design of the Ferrari 488 Spider are of an impressive and aerodynamic nature that is not only exciting for the driver, but the passenger is always delighted by the sheer ease and capabilities of this powerful convertible. Even the most novice car enthusiast can drive one of these luxury automobiles with its exceptional handling and control. 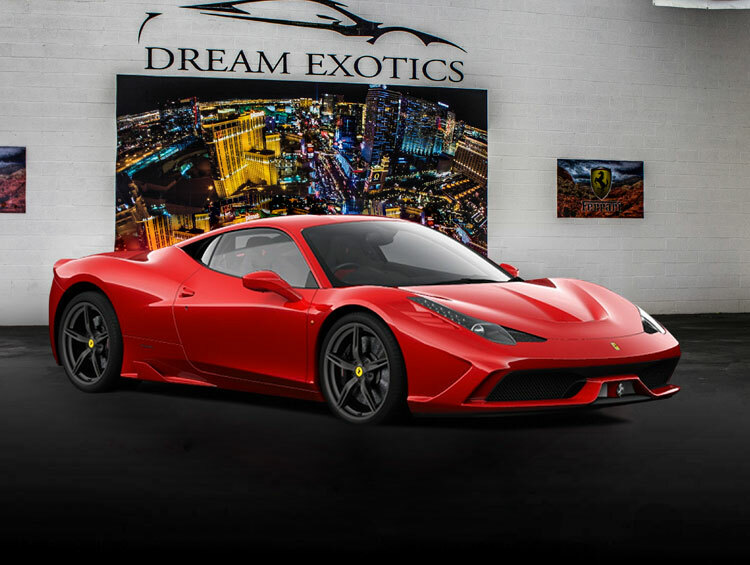 Renting a Ferrari 488 Spider in Las Vegas has never been easier than at Dream Exotics. We offer the largest fleet of exotic cars in Vegas at the lowest rates, and we even provide complimentary pick ups and drop offs anywhere in town. Contact us today to reserve your Ferrari rental.